Atlantic Pump offers a wide range of fiberglass reinforced pumps manufactured by Fybroc Pumps in Maine. Fybroc pumps come in an assortment of materials designed to provide outstanding corrosion resistance. These pumps are well suited for tough pumping applications involving caustics, brines, acids, bleaches, seawater, waste liquids, and solvents. Whether you need local inventory or support for Fybroc’s pumps in Maine, as a factory-trainedstocking distributor of Fybroc products, Atlantic Pump is here to assist. For 30 years, Fybroc has set the industry standard for non-metallic pumps, after manufacturing the first fiberglass reinforced pump in 1966. Fybroc pumps are manufactured using a Resin Transfer Molding (RTM) process for the fiberglass components, resulting in both optimal strength and corrosion resistance. The RTM process uses long strand fiberglass to precisely reinforce high stress areas of the pump. The physical properties of fiberglass allow thinner walled structures, thereby permitting the use of essentially pure resin systems, optimizing corrosion resistance. The advantage of the RTM process is the ability to optimize both strength and resistance to corrosion – something the compression molding process cannot do. 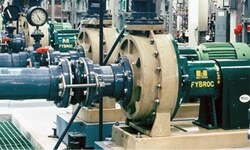 Fybroc is owned by CECO Environmental and operates as a brand of Met-Pro Global Pump Solutions. Atlantic Pump has factory authorized maintenance facilities for Fybroc Pump products. The difference between Series 1600 and Series 1630 is that Series 1630 offers space and weight savings of a close-coupled pump.